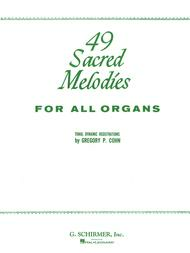 Organ Solo. Edited by Gregory P. Cohn. Organ Collection. Sacred. 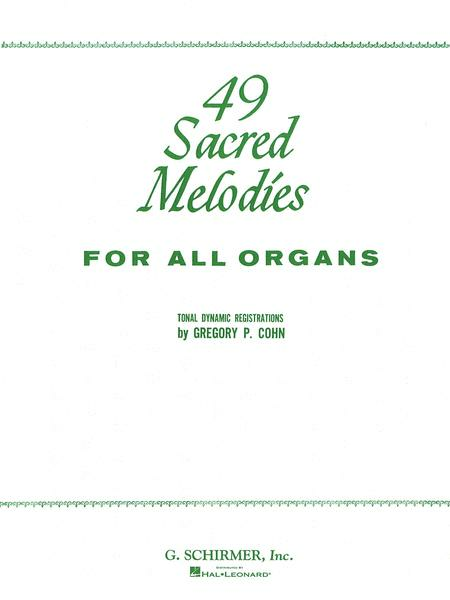 Organ solo songbook. With standard notation, tonal dynamic registrations and lyrics. 64 pages. G. Schirmer #ED2854. Published by G. Schirmer (HL.50332120). Tonal Dynamic Registrations by Cohn. Contents: Monk: Abide With Me • Holden: All Hail The Power Of Jesus' Name • Thome: Andante Religioso (Theme) • Mascagni: Ave Maria (from Cavalleria Rusticana) • Mozart: Ave Verum (Jesu, Word of God Incarnate) • Spillman: Away In A Manger • Wagner: Bridal Chorus (from Lohengrin) • Rodney: Calvary (Theme) • Wesley: The Church's One Foundation • De Giardini: Come, Thou Almighty King • Pitts: Come To The Church In The Wildwood • Deep River • Bourgeois: Doxology • Willis: Fairest Lord Jesus • The First Nowell • Redhead: Go To Dark Gethsemane • Stainer: Processional to Calvary (from Crucifixion), God So Loved The World (from Crucifixion) • Bradbury: He Leadeth Me, Just as I Am • Heav'n, Heav'n • S. Adams: The Holy City • Dykes: Holy Holy Holy, Lead Kindly Light • Granier: Hosanna • Handel: I Know That My Redeemer Liveth (from Messiah) • Mendelssohn: O Rest In the Lord (from Elijah), If With All Your Hearts (from Elijah) • Parker: Jerusalem • Gould: Jesus, Saviour, Pilot Me • Little David, Play On Your Harp • Lutkin: The Lord Bless You and Keep You • Allitsen: The Lord Is My Light • Mason: Nearer, My God, To Thee • Redner: O Little Town of Bethlehem • Barnby: O Perfect Love – Barnby; Sullivan: Onward, Christian Soldiers • Humperdinck: Prayer (from Hansel And Gretel) • Prayer of Thanksgiving (Netherlands Folk Tune) • Roll, Jordan, Roll • Nevin: The Rosary • Gruber: Silent Night, Holy Night • Star Of The East • Steal Away To Jesus • Sibelius: Trust (Finlandia) • Handel: Trust In The Lord (from Xerxes) • Cherubini: Veni, Jesu, Amor Mi • Mendelssohn: Wedding March (from A Midsummer Night's Dream) • Converse: What A Friend We Have In Jesus. This book has a nice variety of pieces, mostly of intermediate level, that can be used throughout the church year. I ordered this book because it had many classic songs in it—but the songs I wanted to play ("The Holy City" for example) weren't the complete versions and whole sections were left out. I returned the book immediately. 23 of 52 people found this review helpful. This is a good selection of material, clearly written, a good book for church organists to have in their bag. 37 of 72 people found this review helpful.